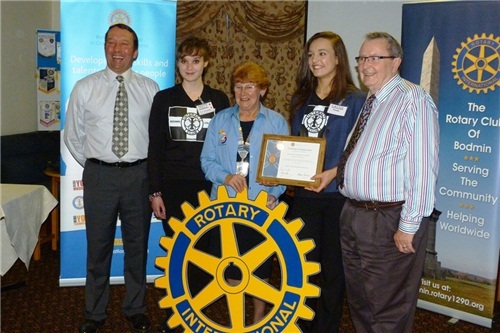 Interact Club for 12-18year olds - supported by The Rotary Clubs of Bodmin & Lostwithiel. President Jess, Vice Pres Amy, Treasurer Kai, Asst Treas Lavender, Secretary Niamh, Asst Sec Megan, Press Leah, Abbie, Rhiannon, Arwen. The event began on Friday night when 12 Interactors from Bodmin College assembled at Tor View courtesy of Neil and Clare Hugo. The students arrived under their own steam and met in the lounge of Tor View Barn to receive information about the rally. The first event that had been arranged for them was clay pigeon shooting, using electronic rifles and clay pigeons. The students and Paula and Carol and Stephen Lay thoroughly enjoyed themselves. It was a very realistic experience and could be something that the club might get involved with for an entertaining evening. The students and staff then returned to the lounge for hot chocolate and marshmallows and began an evening of talking and playing indoor games, draughts, chess and shove ha'penny. Some chose to watch a movie on TV. The group went to bed at 10.00pm and all had a good night's sleep. Breakfast of cereals and toast were had from 8.00am and then we awaited the arrival of other Interactors from Penryn and Penzance. They arrived at about 10.00am and assembled in the lounge where they were all encouraged to introduce themselves. There were 8 Interactors from Penzance with 2 teachers and 6 from Penryn with two teachers and a Rotarian. They had come by minibus. The group was then divided into equal teams, Bodmin1 and Bodmin 2,Penryn and Humphrey Davey. These teams then competed against each other in a mini knockout competition. The events included archery,table tennis shelter box tent erection and football.The team with. 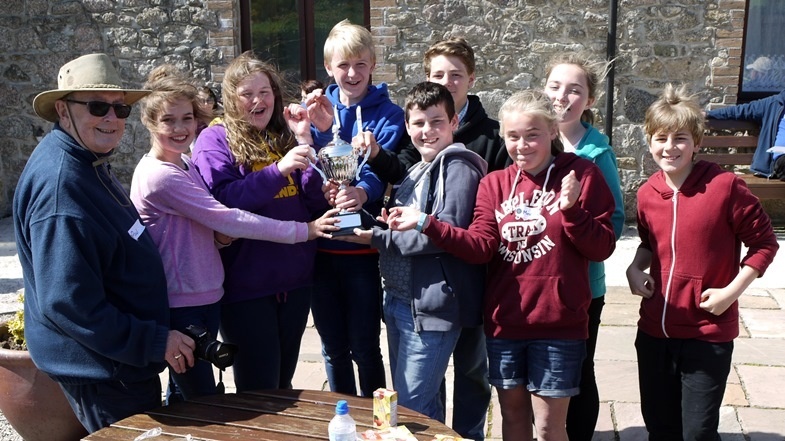 The most points would receive the Interact Challenge Cup, sponsored by Bodmin and Lostwithiel Rotary Clubs. After 3 events a barbecue was served on the patio, sausages and hamburgers salads and dressings and fruit were served and squash. The teams then returned to complete the challenge and receive the Cup. The winners were Humphrey Davey School, Penzance. All of the students enjoyed the day and were insistent that it be continued next year. Same venue. I should like to thank all the participants,parents teachers and Rotarians who made it a very successful event. Particular thanks to Clare and Neil Hugo, for the use of Tor View, and Carol Lay,Lostwithiel Rotary Club, for organising the event. 2) Collecting for 'Food Bank' on a regular basis. Rotaract membership looking good - now standing at 19. Secretary: Jenna Grimwade, Assistant: Emily Niven, Treasurer: Alice May. Internet Press Officer: Ryan Rowe, Assistant: Tegan Farrow. Press Officer: Emma Wooton, Assistant: Issi Brinsley. Congratulations to those students and those of you who do not hold any positions, we still need an Assistant President, Becky to attend a Student Council Meeting for experience. 2) It was agreed that we would like to visit the CHICK's retreat. Miss Fassenfelt to contact Mick from CHICKS's and get permission from Mr Elliot. 3) It was agreed that we would like to buy presents for the Whitehouse Residents ( possibly spending between 50 and 100) and it was decided that CD's, Films and "ornaments" would be best. Miss Fassenfelt to contact the Whitehouse to arrange a firm date after seeking permission from Mr Elliot. Date for shopping to be arranged. 4) It was agreed that we should limit bi fundraising events to one each term. Jenna Grimwade to organise a Karaoke Night ? 5) We Still have lollipops to sell. Anyone who has a free lunch or break break to sell them. 6) Fridays are "Hot Chocolate" days. A timetable for helpers needs to be organised. 7)Miss Day has been asked by Mr Elliot for a piece about Interact for the website. Press Oficers and Assistants to meet and agree a paragraph. (Already completed) Interact members to have a photo taken next Tuesday lunchtime. The club have been very active over the past 6 months and have maintained interest & membership, now supporting 18 members. Fund raising activities have been very productive and have totalled 400.00 - Interact Members have decided to donate this to 'CHICKS' in the near future. They have also sponsored Wadebridge Rowing Club with 50.00. Photo shows Joel Corbett, Paul Harrison and Jenna Grimwade at the District Conference. 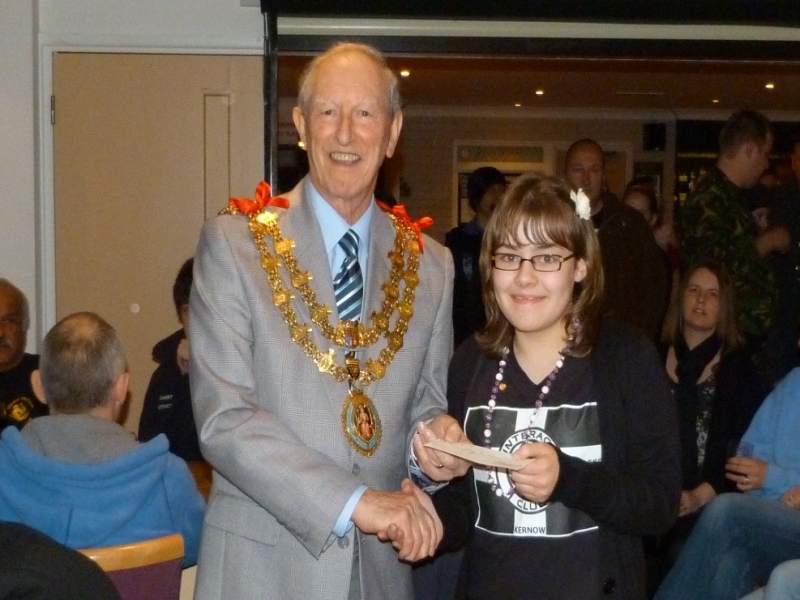 Feb. 6th 2012 - Rebecca Blanchard a member of the INTERACT CLUB receiving a cheque from the "Joint Fireworks Committee". Presented by Mayor of Bodmin Cllr. Ralph Soloman. The success of the 5th Nov. 2011 Firework Display allowed approx. 9000 to be distributed between 59 youth organisations in and around Bodmin.
" BODMIN and LOSTWITHIEL INTERACT CLUB "
Photo : L to R - Rtn. Neil Hugo, Miss Holly Yeo ( Interact Vice President), DG Maxine Stoyle, Miss Cassie Brewer (Interact President), Rtn. Paul Harrison. On Wednesday 23rd November nine students from Bodmin College were the guests of about 60 Rotarians from Rotary Clubs of Bodmin and Lostwithiel to celebrate the formation of their Interact Club; the first in Cornwall, and also the first Interact club south of Bristol. 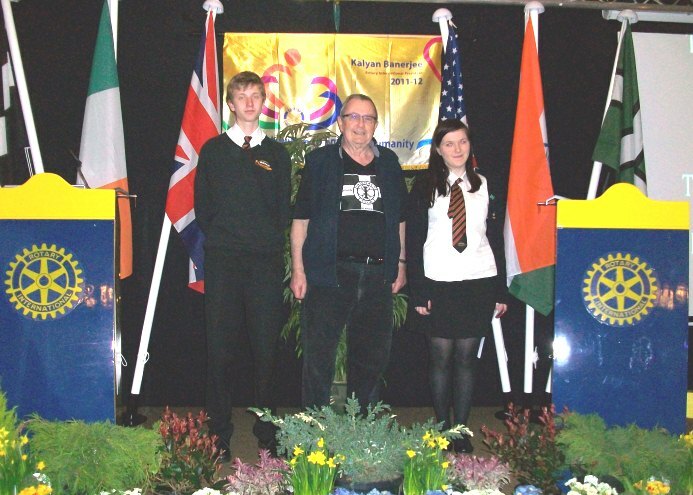 Interact clubs are sponsored by Rotary Clubs and are open to 12 to 18 year olds. The purpose of the club is to develop leadership skills and self-confidence through teamwork. They agree to undertake one local and one international project per year, build respect for the rights of others, develop personal integrity and advance international understanding. The celebration was held at the Westberry Hotel, Bodmin. In addition to the nine members of the Interact club, two members of staff who act as advisors, Sarah Walton and Polly Day, together with Headteacher, Brett Elliot also attended the celebration. To rapturous applause Rotary District Governor, Mrs Maxine Stoyle presented the certificate of inauguration to Miss Cassie Brewer, the President of the club and each member of the club was presented with an Interact Badge. The nine members then gave a presentation to the assembled Rotarians, informing them of the projects that they had been involved with, including raising approximately 400 for Cancer research, visiting local nursing homes and entertaining the residents, litter picking in conjunction with Rotarians and involvement with Rotary's Polio Plus project. They also outlined future activities including sending a fire engine to Kenya and loading with books for a slum school in Nairobi, also a fund raising programme in the College to raise funds for further projects. Rotarian Paul Harrison commented, "we hear so much about the misdeeds of youngsters today, but this collection of young people is something that the local community should be very proud of. 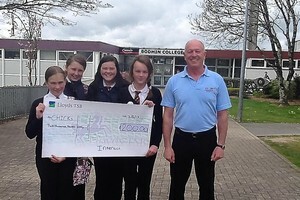 They are a credit to their families, their college and to Bodmin and Lostwithiel Rotary Clubs". The Interact Club has taken a year to achieve formal recognition and during that time the Club has already undertaken a number of projects. In October 2010 members of Bodmin & Lostwithiel Rotary Clubs gave a presentation to Year 9 students at Bodmin College and as a result of that presentation the first meeting was held at lunchtime at the College. With the enthusiasm and support of Sarah Walton, the global citizenship co-ordinator at the college, the students showed the necessary commitment and interest to continue to meet. Each Interact Club undertakes to work on at least two community service projects per year, one local and the other International. And now other schools in Cornwall are showing renewed interest in Interact. At a meeting on Monday 3rd October, hosted by Truro's Richard Lander School, the nine young people from Bodmin College Interact Club gave an animated talk in a crowded lecture hall on what Interact has meant for them. 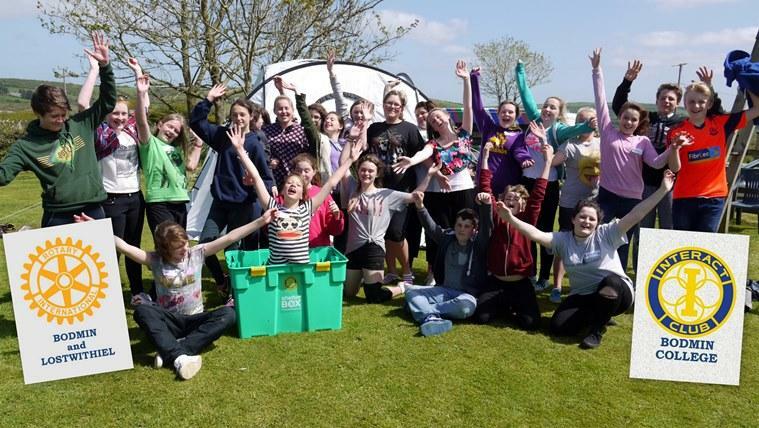 Kate Lancaster, 17, one of the Bodmin group, said: "It was brilliant to be able to share with others exactly what it is that we do Interact benefits us and the community immensely." Interact stands for International Action and is the junior arm of Rotary and comprises 12 to 18 year olds in its membership. The first club was established in 1962 and worldwide there are now over 12,300 clubs in 133 different countries, with over 290,000 members. Members learn a great deal about service and leadership skills, but also get a great deal of enjoyment form working together. Detailed information on the club and their activities will be added in due course.